Dress up your motor with this chrome-plated filter housing. 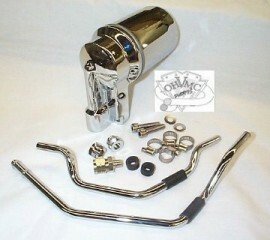 Filter kit fits all Softail® models 1992 - 99, as well as S & S cases with oil filter mounting bosses on the front. Will also fit other model 92-99 Evolution motors (other than Softail®) using the stock oil return tubes - OEM part # 33518-92 - in place of the one in the kit. Replaces OEM part # 26415-98.